I was so excited that my garden produced beautiful veggies even though it is not is much as I expected, still it was fantastic to pick some fresh produce and cook with it for my family. Those green monsters, as well as bunnies and birds, ate a lot of it but that’s ok, next time I will be more prepared as this was my first real-real garden. Most of the ingredients that you see in the pictures are either from our garden or organic. By the way, those yummy red tomatoes are from my neighbor. They have the sweetest and juiciest tomatoes ever, so he always brings us during summer time. Don’t I have the best neighbor? I just wish mine turn out like that. Seriously, they are so good that I eat them like an apple. I really hope you give this simple soup a try because it is delicious, but I understand that it is not everybody’s cup of tea. I need something spicy with it for example to give more heat and flavor, my daughter loves it with onions and boys to dip bread in and eat it with pickles. 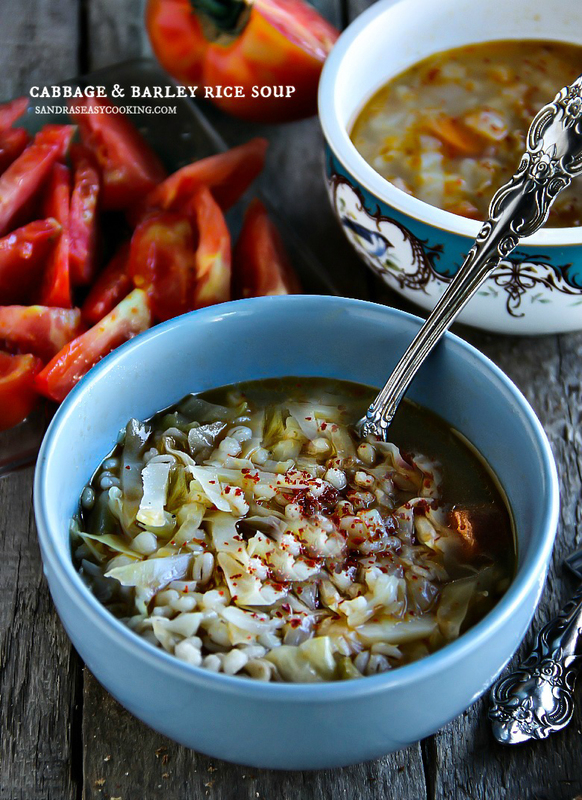 If you are cabbage lover, this soup is for you, plus it is very healthy and light. On the other hand, you CAN add bacon, smoked sausage/meat in it to give you that smoky flavor. We love it like that too, and it is not bad at all however since we try to have at least 3 days a week clean meals, I omitted bacon or any meat. So it is truly very healthy soup! These few days have been little colder than usual. Actually, it’s very unusual to have a temp in 70’s F in mid of July so comforting soup is just what we needed. If you don’t like barley rice, you can add few cubed potatoes, brown rice, lentils or regular white rice, but we love barley so that’s why I am adding it most often. In a large pot add oil and saute chopped onion for few minutes, then add carrots, celery, and garlic. Saute all together for additional few minutes. Add Sliced Cabbage, and pour broth and water, stir. Add seasonings; salt, pepper, bouillon cube, chili pepper flakes. Put in Barley Rice and stir well. Cover and let it cook for 20 minutes under the lid, then stir again and place lid halfway open. 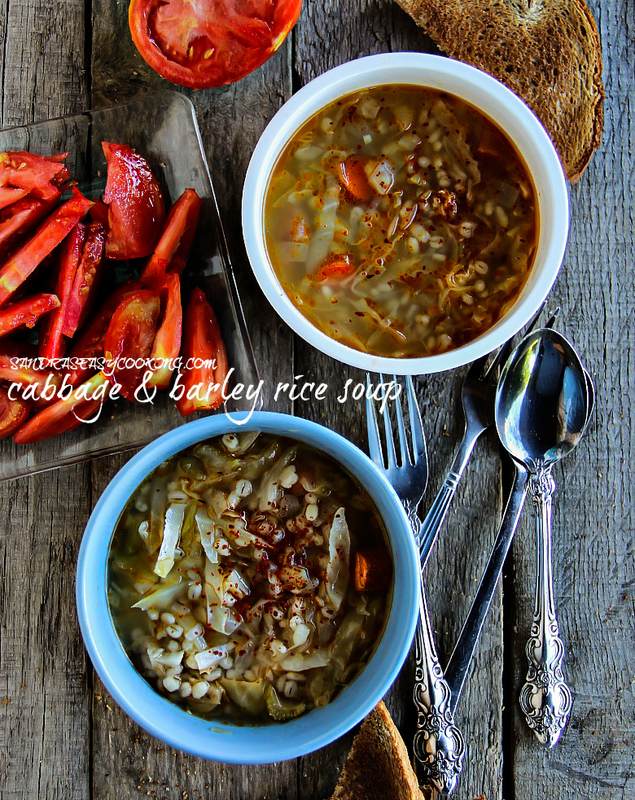 Let it cook until barley rice is completely cooked. It will still be chewy but after 45 minutes should be completely cooked. Serve hot! This soup can be stored in the fridge in airtight container for up to 5 days. You can add more vegetables, such as peppers, peas, green beans, potatoes etc. OR instead of rice, you can add lentils.